Army chiefs have said that the military would not support any move to place the Philippines under a revolutionary government. 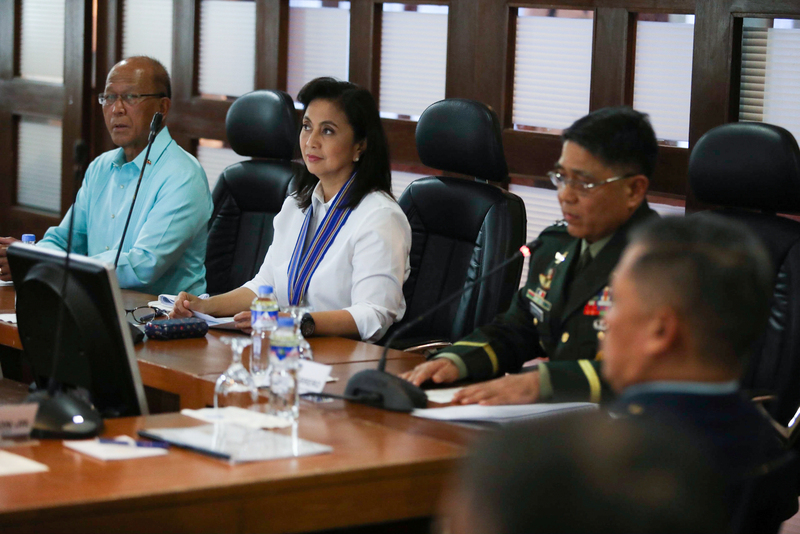 Defence Secretary Delfin Lorenzana and Lieutenant General Rey Leonardo Guerrero, chief of the Armed Forces of the Philippines (AFP), made the assurance to Vice President Leni Robredo. Following a request from the Vice President, the AFP chief briefed her on the ongoing rehabilitation efforts in war-torn Marawi City. The security briefing was held at the Philippine Air Force headquarters at Villamor Air Base in Pasay City this afternoon (Wednesday, November 8). The Vice President said the military gave a “very comprehensive” briefing on the efforts to rebuild Marawi after being liberated from Islamic State-affiliated terrorists last month. The fighting raged for a full five months and left much of the city flattened. During the meeting, she asked the AFP’s stand on declaring a revolutionary government, a possibility recently raised by President Duterte. Speaking to reporters afterwards, she said: “Both Secretary Lorenzana and AFP chief of staff Guerrero assured us, in no uncertain terms, that they would not support a revolutionary government nor any other threat to the Constitution. Last month, the president threatened to form a “revolutionary government” to head off what he alleges is a widespread destabilisation plot. Addressing communist groups, as well as the “yellows”, or the allies of Liberal Party, he said he would make the move if ever “your destabilisation is worsening and it is becoming chaotic”. In response, opposition group Tindig Pilipinas, whose politician members are part of Leni Robredo’s Liberal Party, called the president a “paranoid and insecure little man”. The Vice President, however, is not a member of this opposition coalition.